New Hampshire farm holidays will take you, take you to a variety of landscapes encompassing mountains, lakes or beaches. Stay on a farm or ranch for a peaceful and cheap alternative. 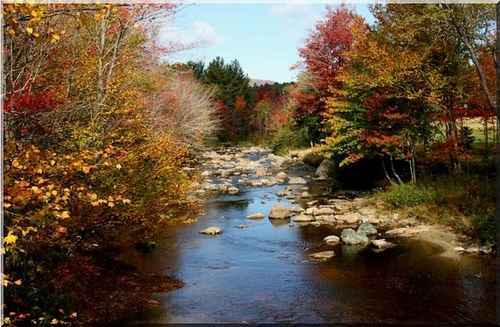 We welcome you to explore this area of great beauty, also known as the "Granite State", no matter what time of the season. However, during the Fall the wonderful autumn hues are a sight to see and something that one has to experience at least once in their lifetime. This was once home to Robert Frost, the poet. Visit this state and you will understand why it was a place that inspired his poetry. You may also like to visit his farm in Derry. New Hampshire is made up of seven very different regions, each as exciting as the next. The Seacoast, Dartmouth-Lake Sunapee, Lakes Region, Merrimack Valley, Monadnock Region, White Mountains and Great North Woods are filled with natural beauty, cultural events and classic New England living. There is so much to offer the energetic traveler. New Hampshire's Presidential Range, peaks named for the country's founding fathers, is considered the best hiking in the Northeast. Taking a trip into the White Mountains will lead you to quiet roads and countryside or take time out to explore the forest. Sporting adventures are a way of life, from hunting to fishing, camping, hiking, boating, wildlife watching, skiing and snowmobiling. For those who love wildlife, the Great North Woods is the place to be for moose and black bear. Boaters will love the Lakes region, especially Lake Winnipesaukee with its 72 square miles of summer water fun to explore, from rafts and boats to waterfront attractions. This is a great place for boating, fishing and bird watching. In the winter one can come here for a farm holiday and go ice-fishing and skiing. The countryside here is not only decorated with mountains and lakes. You can take a step back in time by visiting the historic Canterbury Shaker Village and tour the historic mansion known as the "Castle in the Clouds" in Moultonborough. On the opposite coast is the Dartmouth-Lake Sunapee Region. An area of pristine lakes, rolling countryside and quiet country roads. Mount Sunapee is a year-round recreation destination offering scenic views of the lake and neighboring mountains. At Mount Cardigan, a winding road takes visitors to a treeless, granite summit that offers a 360 degree view. Monadnock Region is your quintessential New England region where you can find your houses with the white picket fences, the clapboard churches and the manicured lawns. Merrimack Valley is the most populated and fastest growing region of the state. It's a region rich in history and natural beauty and home to the historic communities of Lowell, Lexington and Concord. The Merrimack River provides a home to countless species of wildlife, a recreation area for kayakers and boaters and an arena for fisherman to try their sport. Seacoast Region is popular with sunseekers and summer tourists. What New Hampshire's Seacoast lacks in size it makes up for in vacation fun. Most of its 18 miles of shoreline are public, and the beaches are sandy, clean and well managed by town and state governments. So come here for your next farm holiday. Have a look at our farm and ranch accommodation. You are sure to find something that meets your needs and your budget. If you have a farm in New Hampshire that you would like to showcase visit our Farm Forum. You can upload a picture and brag a little. We don't mind! Share a farming story, tell us about your best or worst farm holiday and lots more. There are other individual farming discussion boards to contribute to through this forum, as well as a Craft & Recipes Forum where you can share your favourite recipes and also get some crafting ideas for various arts & crafts.